This looks like it may be significant. 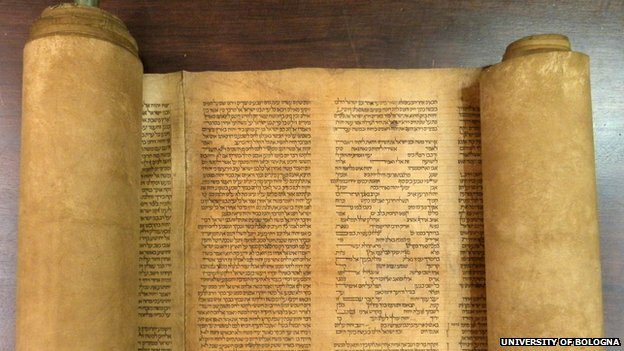 A Torah scroll in the library of the University of Bologna in Italy is thought to be more than 850 years old. A librarian in 1889 had examined the scroll and dated it to the 17th Century. However, a reexamination of the scroll and carbon dating tests have now dated the scroll to be much older, making it the oldest complete text of the Torah known to exist. The script used in the scroll is from the oriental Babylonian tradition. I’m curious about the “features forbidden in later copies under rules laid down by the scholar Maimonides in the 12th Century”. Are there any Maimonides scholars reading this who can enlighten me? ← Does the New Testament always quote from the Septuagint? By the way, this isn’t the oldest Torah text in the world. The Leningrad and the Aleppo Bibles pre-date the Bologna scroll by more than 200 years, but they are both Hebrew codexes, or books, and not scrolls. This is the oldest Torah scroll. The Qumran texts (Dead Sea Scrolls) are of course even older, and they are scrolls, but they don’t include a complete Torah scroll. The Torah section of the Aleppo codex also isn’t complete. Sections of the book were lost when the Aleppo synagogue was was burned by a rioting mob in 1947 and the Codex damaged. Only 294 of the original 487 pages survived and all of the Torah except for the last few pages were lost. It was smuggled out of Syria and is now safely in Israel. Having said that, the Aleppo codex is extremely valuable and important to scholars and Maimonides himself consulted it.